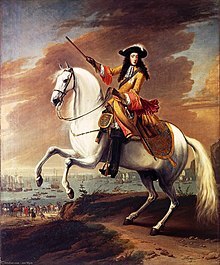 The Glorious Revolution, also called the Revolution of 1688, was the overthrow of King James II of England (James VII of Scotland) by a union of English Parliamentarians with the Dutch stadtholder William III, Prince of Orange, who was James's nephew and son-in-law. William's successful invasion of England with a Dutch fleet and army led to his ascension to the throne as William III of England jointly with his wife, Mary II, James's daughter, after the Declaration of Right, leading to the Bill of Rights 1689. King James's policies of religious tolerance after 1685 met with increasing opposition from members of leading political circles, who were troubled by the King's Catholicism and his close ties with France. The crisis facing the King came to a head in 1688, with the birth of his son, James, on 10 June (Julian calendar). [a] This changed the existing line of succession by displacing the heir presumptive (his 26-year-old daughter Mary, a Protestant and the wife of William of Orange) with young James as heir apparent. The establishment of a Roman Catholic dynasty in the British kingdoms now seemed likely. Some Tory members of parliament worked with members of the opposition Whigs in an attempt to resolve the crisis by secretly initiating dialogue with William of Orange to come to England, outside the jurisdiction of the English Parliament. Stadtholder William, the de facto head of state of the Dutch United Provinces, feared a Catholic Anglo–French alliance and had already been planning a military intervention in England. 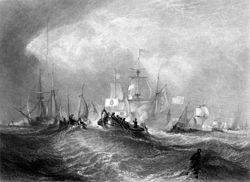 After consolidating political and financial support, William crossed the North Sea and English Channel with a large invasion fleet in November 1688, landing at Torbay. After only two minor clashes between the two opposing armies in England, and anti-Catholic riots in several towns, James's regime collapsed, largely because of a lack of resolve shown by the king. This was followed, however, by the protracted Williamite War in Ireland and Dundee's rising in Scotland. [b] In England's distant American colonies, the revolution led to the collapse of the Dominion of New England and the overthrow of the Province of Maryland's government. Following a defeat of his forces at the Battle of Reading on 9 December 1688, James and his wife Mary fled England; James, however, returned to London for a two-week period that culminated in his final departure for France on 23 December 1688. By threatening to withdraw his troops, William, in February 1689 ( New Style Julian calendar), [a] convinced a newly chosen Convention Parliament to make him and his wife joint monarchs. The Revolution permanently ended any chance of Catholicism becoming re-established in England. For British Catholics its effects were disastrous both socially and politically: For over a century Catholics were denied the right to vote and sit in the Westminster Parliament; they were also denied commissions in the army, and the monarch was forbidden to be Catholic or to marry a Catholic, this latter prohibition remaining in force until 2015. The Revolution led to limited tolerance for Nonconformist Protestants, although it would be some time before they had full political rights. It has been argued, mainly by Whig historians, that James's overthrow began modern English parliamentary democracy: the Bill of Rights 1689 has become one of the most important documents in the political history of Britain and never since has the monarch held absolute power. Internationally, the Revolution was related to the War of the Grand Alliance on mainland Europe. It has been seen as the last successful invasion of England. It ended all attempts by England in the Anglo-Dutch Wars of the 17th century to subdue the Dutch Republic by military force. The resulting economic integration and military co-operation between the English and Dutch navies, however, shifted the dominance in world trade from the Dutch Republic to England and later to Great Britain. The expression "Glorious Revolution" was first used by John Hampden in late 1689,  and is an expression that is still used by the British Parliament. The Glorious Revolution is also occasionally termed the Bloodless Revolution, albeit inaccurately. The English Civil War (also known as the Great Rebellion) was still within living memory for most of the major English participants in the events of 1688, and for them, in comparison to that war (or even the Monmouth Rebellion of 1685) the deaths in the conflict of 1688 were few. During his three-year reign, King James II became directly involved in the political battles in England between Catholicism and Protestantism, and between the concept of the divine right of kings and the political rights of the Parliament of England. James's greatest political problem was his Catholicism, which left him alienated from both parties in England. The low church Whigs had failed in their attempt to pass the Exclusion Bill to exclude James from the throne between 1679 and 1681, and James's supporters were the high church Anglican Tories. In Scotland, his supporters in the Parliament of Scotland stepped up attempts to force the Covenanters to renounce their faith and accept episcopalian rule of the church by the monarch. When James inherited the English throne in 1685, he had much support in the 'Loyal Parliament', which was composed mostly of Tories. His Catholicism was of concern to many, but the fact that he had no son, and his daughters, Mary and Anne, were Protestants, was a "saving grace". James's attempt to relax the Penal Laws alienated his natural supporters, however, because the Tories viewed this as tantamount to disestablishment of the Church of England. Abandoning the Tories, James looked to form a 'King's party' as a counterweight to the Anglican Tories, so in 1687 James supported the policy of religious toleration and issued the Declaration of Indulgence. The majority of Irish people backed James II for this reason and also because of his promise to the Irish Parliament of a greater future autonomy. By allying himself with the Catholics, Dissenters, and Nonconformists, James hoped to build a coalition that would advance Catholic emancipation. James also created a large standing army and employed Catholics in positions of power within it. To his opponents in Parliament this seemed like a prelude to arbitrary rule, so James prorogued Parliament without gaining their consent. At this time, the English regiments of the army were encamped at Hounslow, near the capital. It was feared that the location was intended to overawe the City. The army in Ireland was purged of Protestants, who were replaced with Catholics, and by 1688 James had more than 34,000 men under arms. Matters came to a head in June 1688, when the King had a son, James; until then, the throne would have passed to his Protestant daughter, Mary. The prospect of a Catholic dynasty in the kingdoms of England, Scotland and Ireland was now likely. William was also stadtholder of the main provinces of the Dutch Republic, then in the preliminary stages of joining the War of the Grand Alliance against France, in a context of international tensions caused by the revocation by Louis XIV of the Edict of Nantes and the disputed succession of Cologne and the Electorate of the Palatinate. William had already acquired the reputation of being the main champion in Europe of the Protestant cause against Catholicism and French absolutism; in the developing English crisis he saw an opportunity to prevent an Anglo-French alliance and bring England to the anti-French side, by carrying out a military intervention directed against James. This suited the desires of several English politicians who intended to depose James. It is still a matter of debate whether the initiative for the conspiracy was taken by the English or by the stadtholder and his wife. William had been trying to influence English politics for well over a year, letting Grand Pensionary Gaspar Fagel publish an open letter to the English people in November 1687 deploring the religious policy of James, which action had generally been interpreted as a covert bid for kingship. In Germany, matters had come to a head. The Pope had refused to confirm Louis's favourite candidate for the bishopric of Cologne, William Egon of Fürstenberg. Enraged, the French king decided to execute a lightning campaign into Germany before the emperor could shift his troops to the West. Louis also hoped to keep his Turkish ally in the war this way. For the immediate future James had to hold his own, something Louis expected him to be quite capable of, especially if the Dutch were intimidated. On 9 September (Gregorian calendar) the French envoy, D'Avaux, handed two letters from the French king, who had known of the invasion plans since May, to the States General of the Netherlands. In the first they were warned not to attack James. In the second they were advised not to interfere with the French policy in Germany. James hurriedly distanced himself from the first message, trying to convince the States General that there was no secret Anglo-French alliance against them. [e] This had precisely the opposite effect: many members became extremely suspicious. The second message proved that the main French effort was directed to the east, not the north, so there was no immediate danger of a French invasion for the Republic itself. From 22 September, [a] Louis XIV seized all Dutch ships present in French ports,  totalling about a hundred vessels, apparently proving that real war with France was imminent, though Louis had meant it to be a mere warning. On 26 September the powerful city council of Amsterdam decided to officially support the invasion. On 27 September Louis crossed the Rhine into Germany to attack Philippsburg and William began to move the Dutch field army from the eastern borders, where it had trained on the Mookerheide, to the coast, even though most of the new mercenaries had not yet arrived. William considered his veteran army to be sufficient in size to defeat any forces (all rather inexperienced) that James could throw against him, but it had been decided to avoid the hazards of battle and maintain a defensive attitude in the hope James's position might collapse by itself. Thus he landed far away from James's army, expecting that his English allies would take the initiative in acting against James while he ensured his own protection against potential attacks. William was prepared to wait; he had paid his troops in advance for a three-month campaign. A slow advance, apart from being necessitated by heavy rainfall anyway, had the added benefit of not over-extending the supply lines; the Dutch troops were under strict orders not even to forage, for fear that this would degenerate into plundering, which would alienate the population. Meanwhile, on 18 November Plymouth had surrendered to William, and on 21 November he began to advance. By 24 November, William's forces were at Sherborne and on 1 December at Hindon. On 4 December he was at Amesbury, and was received by the mayor of Salisbury;  three days later they had reached Hungerford, where the following day they met with the King's Commissioners to negotiate. James offered free elections and a general amnesty for the rebels. In reality, by that point James was simply playing for time, having already decided to flee the country. He feared that his English enemies would insist on his execution and that William would give in to their demands. Convinced that his army was unreliable, he sent orders to disband it. On 9 December, the two sides fought a second engagement with the Battle of Reading, a defeat for the King's men. In the night of 9/10 December, the Queen and the Prince of Wales fled for France. The next day saw James's attempt to escape, the King dropping the Great Seal in the Thames along the way, as no lawful Parliament could be summoned without it. However, he was captured on 11 December by fishermen in Faversham opposite Sheerness, the town on the Isle of Sheppey. On the same day, 27 Lords Spiritual and Temporal, forming a provisional government, decided to ask William to restore order but at the same time asked the king to return to London to reach an agreement with his son-in-law. It was presided over initially by William Sancroft, Archbishop of Canterbury and, after it was learned that James was still in England, by George Savile, 1st Marquess of Halifax. On the night of 11 December there were riots and lootings of the houses of Catholics and several foreign embassies of Catholic countries in London. The following night a mass panic gripped London during what was later termed the Irish night. False rumours of an impending Irish army attack on London circulated in the capital, and a mob of over 100,000 assembled ready to defend the city. Upon returning to London on 16 December, James was welcomed by cheering crowds. He took heart at this and attempted to recommence government, even presiding over a meeting of the Privy Council. [g] He sent the Earl of Feversham to William to arrange for a personal meeting to continue negotiations. Now it became evident that William had no longer any desire to keep James in power in England. He was extremely dismayed by the arrival of Lord Feversham. He refused the suggestion that he simply arrest James because this would violate his own declarations and burden his relationship with his wife. In the end it was decided that he should exploit James's fears; the three original commissioners were sent back to James with the message that William felt he could no longer guarantee the king's well-being and that James for his own safety had better leave London for Ham. 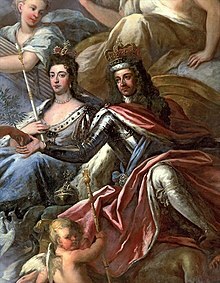 William III and Mary II reigned together for five years. William reigned on his own following Mary's death in 1694. On 28 December, William took over the provisional government by appointment of the peers of the realm, as was the legal right of the latter in circumstances when the king was incapacitated, and, on the advice of his Whig allies, summoned an assembly of all the surviving members of parliament of Charles II's reign, thus sidelining the Tories of the Loyal Parliament of 1685. 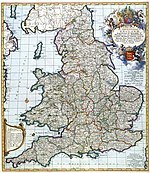 This assembly called for a chosen English Convention Parliament, elected on 5 January 1689 NS, [a] which convened on 22 January. William did not intervene in the election that followed. This elected body consisted of 513 members, 341 of whom had been elected before, 238 having been members of at least one Exclusion Bill Parliament, but only 193 having been elected in 1685. The name "Convention" was chosen because only the king could call a Parliament, although as William had been appointed de facto regent by the peers the Convention could be argued to be, strictly speaking, a lawful Parliament. James had cultivated support on the fringes of his Three Kingdoms – in Catholic Ireland and the Highlands of Scotland. Supporters of James, known as Jacobites, were prepared to resist what they saw as an illegal coup by force of arms. The first Jacobite rebellion, an uprising in support of James in Scotland, took place in 1689. It was led by John Graham, 1st Viscount Dundee, also known as Graham of Claverhouse or Bonnie Dundee, who raised an army from Highland clans. In Ireland, Richard Talbot, 1st Earl of Tyrconnell led local Catholics, who had been discriminated against by previous English monarchs, in the conquest of all the fortified places in the kingdom except Derry, and so held the Kingdom for James. James himself landed in Ireland with 6,000 French troops to try to regain the throne in the Williamite War in Ireland. The war raged from 1689 to 1691. James fled Ireland following his defeat at the Battle of the Boyne in 1690, but Jacobite resistance was not ended until after the battle of Aughrim in 1691, when over half of their army was killed or taken prisoner. The Irish Jacobites surrendered under the conditions of the Treaty of Limerick on 3 October 1691. England stayed relatively calm throughout, although some English Jacobites fought on James's side in Ireland. Despite the Jacobite victory at the Battle of Killiecrankie, the uprising in the Scottish Highlands was quelled due to the death of its leader, Dundee, and Williamite victories at Dunkeld and Cromdale, as well as the Glencoe massacre in early 1692. Many, particularly in Ireland and Scotland, continued to see the Stuarts as the legitimate monarchs of the Three Kingdoms, and there were further Jacobite rebellions in Scotland during the years 1715, 1719 and 1745. Though he had carefully avoided making it public, William's main motive in organising the expedition had been the opportunity to bring England into an alliance against France. On 9 December 1688 he had already asked the States General to send a delegation of three to negotiate the conditions. On 18 February (Julian calendar) he asked the Convention to support the Republic in its war against France; but it refused, only consenting to pay £600,000 for the continued presence of the Dutch army in England. On 9 March (Gregorian calendar) the States General responded to Louis's earlier declaration of war by declaring war on France in return. On 19 April (Julian calendar) the Dutch delegation signed a naval treaty with England. It stipulated that the combined Anglo-Dutch fleet would always be commanded by an Englishman, even when of lower rank; also it specified that the two parties would contribute in the ratio of five English vessels against three Dutch vessels, meaning in practice that the Dutch navy in the future would be smaller than the English. The Navigation Acts were not repealed. On 18 May the new Parliament allowed William to declare war on France. On 9 September 1689 (Gregorian calendar), William as King of England joined the League of Augsburg against France. As the invitation was initiated by figures who had little influence themselves, the legacy of the Glorious Revolution has been described as a successful propaganda act by William to cover up and justify his successful invasion. The claim that William was fighting for the Protestant cause in England was used to great effect to disguise the military, cultural and political impact that the Dutch regime had on England at the time. Prior to his arrival in England, the new king William III of England was not Anglican, but rather was a member of the Dutch Reformed Church. Consequently, as a Calvinist and Presbyterian he was now in the unenviable position of being the head of the Church of England, while technically being a Nonconformist. This was, however, not his main motive for promoting religious toleration. More important in that respect was the need to keep happy his Catholic allies [i] in the coming struggle with Louis XIV. Though he had promised legal toleration for Catholics in his Declaration of October 1688, he was ultimately unsuccessful in this respect, due to opposition by the Tories in the new Parliament. The Revolution led to the Act of Toleration of 1689, which granted toleration to Nonconformist Protestants, but not to Catholics. Catholic emancipation would be delayed for 140 years. The Williamite War in Ireland can be seen as the source of later ethno-religious conflict, including The Troubles of recent times. The Williamite victory in Ireland is still commemorated by the Orange Order for preserving British and Protestant supremacy in the country. In North America, the Glorious Revolution precipitated the 1689 Boston revolt in which a well-organised "mob" of provincial militia and citizens successfully deposed the hated governor Edmund Andros. In New York, Leisler's Rebellion caused the colonial administrator, Francis Nicholson, to flee to England. A third event, Maryland's Protestant Rebellion was directed against the proprietary government, seen as Catholic-dominated. ^ a b c d e f g In this article "New Style" means the start of year is adjusted to 1 January. Events on the European mainland are usually given using the Gregorian calendar, while events in Great Britain and Ireland are usually given using the Julian calendar with the year adjusted to 1 January. Dates with no explicit Julian or Gregorian postscript will be using the same calendar as the last date with an explicit postscript. For an explanation of these changes in calendar and dating styles, see Old Style and New Style dates. ^ England, Scotland, and Ireland at the time shared a king but were still theoretically separate realms with their own parliaments. In practice, the Parliament of Ireland had been completely under the control of Westminster since Poynings' Law of 1494, but Scotland still had a degree of independence. ^ It was rumoured that he was a baby who had been smuggled into the royal bedchamber in a warming pan, but this is not now taken seriously. ^ As there had been in 1672 with the concerted attack by France and England on the Republic on the basis of the Secret treaty of Dover. ^ John Churchill, later the 1st Duke of Marlborough, was the pre-eminent British general of his generation. ^ The importance of the event has divided historians ever since Friedrich Engels judged it "a relatively puny event" ( Engels 1997, p. 269). ^ Coward 1980, pp. 298–302. ^ In testimony before a House of Lords committee in the autumn of 1689 ( Schwoerer 2004, p. 3). ^ "The Glorious Revolution". www.parliament.uk. Retrieved 3 February 2011. ^ Macaulay 1889, pp. 368–69. ^ Carpenter 1956, pp. 96–98. ^ Western 1972, p. 201. ^ Jones 1988, p. 132. ^ Jones 1988, pp. 132–33. ^ Jones 1988, p. 146. ^ Jones 1988, p. 150. ^ Childs 1980, pp. 96–97. ^ Troost 2001, pp. 182–83. ^ Troost 2001, p. 176. ^ Troost 2001, p. 182. ^ Troost 2001, p. 187. ^ Jones 1988, pp. 218–19. ^ Jones 1988, pp. 219–20. ^ Jones 1988, pp. 221–22. ^ a b Jones 1988, p. 222. ^ Jones 1988, pp. 223–24. ^ Troost 2001, p. 191. ^ Baxter 1966, p. 225. ^ Baxter 1966, p. 231. ^ Jones 1988, pp. 238–39. ^ Dalrymple 1790, appendix to book v, pp. 107–10. ^ Dalrymple 1790, appendix to book v, p. 108. ^ Dalrymple 1790, appendix to book v, pp. 108–09. ^ Dalrymple 1790, appendix to book v, p. 109. ^ Tony Claydon, Charles-Édouard Levillain (2016). Louis XIV Outside In: Images of the Sun King Beyond France, 1661-1715. Routledge. p. 150. ISBN 9781317103240. ^ a b c d Rodger 2004, p. 139. ^ a b Troost 2001, p. 198. ^ Jardine 2008, p. 38. ^ Baxter 1966, pp. 232–33. ^ Jardine 2008, p. 52. ^ Swetschinsky & Schönduve 1988, p. 53. ^ Prud'homme van Reine 2009, p. 287. ^ Jardine 2008, p. 41. ^ Jardine 2008, p. 39. ^ Jardine 2008, p. 37. ^ Prud'homme van Reine 2009, p. 288. ^ Jardine 2008, p. 29. ^ Williams 1960, pp. 10–16. ^ Speck 1989, p. 74. ^ Speck 1989, pp. 74–75. ^ Troost 2001, p. 199. ^ a b c d Rodger 2004, p. 137. ^ Jones 1973, pp. 201–21. ^ Rodger 2004, p. 138. ^ Prud'homme van Reine 2009, p. 291. ^ Jardine 2008, pp. 10–11. ^ a b Western 1972, p. 260. ^ Prud'homme van Reine 2009, p. 289. ^ Macaulay 1889, p. 561. ^ Prud'homme van Reine 2009, p. 290. ^ a b Prud'homme van Reine 2009, pp. 290–91. ^ Macaulay 1889, pp. 563–64. ^ a b Macaulay 1889, p. 565. ^ Childs 1980, pp. 175. ^ Harris 2006, p. 204; Sowerby 2013, pp. 347–48; Speck 2002, p. 76. ^ Marquess of Cambridge 1966, pp. 152–53. ^ Childs 1980, p. 4. ^ Beddard 1988, p. 19. ^ Schuchard 2002, p. 762. ^ Western 1972, p. 259. ^ Jardine 2008, p. 16. ^ a b Jardine 2008, p. 15. ^ Jardine 2008, p. 32. ^ Jardine 2008, p. 31. ^ Stanhope 2011, footnote 90. ^ Jardine 2008, p. 56. ^ a b Macaulay, Thomas Babington (21 September 1872). The History of England from the Accession of James the Second. Longmans, Green, and co. Retrieved 21 September 2018 – via Internet Archive. ^ a b Information Services. ^ a b Jardine 2008, p. 17. ^ "No. 2409". The London Gazette. 13 December 1688. p. 1. ^ "No. 2410". The London Gazette. 17 December 1688. p. 2. ^ Jardine 2008, p. 19. ^ Horwitz 1977, p. 9. ^ Horwitz 1977, pp. 9–10. ^ Horwitz 1977, p. 10. ^ Horwitz 1977, p. 11. ^ Jardine 2008, p. 26. ^ Horwitz 1977, p. 12. ^ Williams 1960, p. 26. ^ Williams 1960, p. 27. ^ Williams 1960, pp. 28–29. ^ Carpenter 1956, pp. 145–46. ^ Williams 1960, pp. 37–39. ^ Vries & Woude 1997, pp. 673–87. ^ Jardine 2008, p. 27. ^ Dekrey 2008, pp. 738–73. ^ Cite error: The named reference Pincus 2009 was invoked but never defined (see the help page). ^ Webb 1995, p. 166. ^ Mitchell 2009, xvi, xviii, xix. ^ Black & MacRaid 2000, pp. 7, 8. ^ Israel 2003, pp. 137–38. ^ Israel 2003, pp. 20. Black, Jeremy; MacRaid, Donald M. (2000). Studying History (2 ed.). Palgrave. ISBN 978-0-333-80183-3. Dekrey, Gary S. (2008), "Between Revolutions: Re-appraising the Restoration in Britain", History Compass, 6 (3): 738–73, doi: 10.1111/j.1478-0542.2008.00520.x, ISSN 1478-0542 , Section 3. Davies, D. (1989). "James II, William of Orange and the admirals". In Cruickshanks, Eveline (ed.). By force or default? The revolution of 1688–1689. Edinburgh: John Donald Publishers. ISBN 978-0-85976-279-3. Engels, Friedrich (1997). "Introduction to Socialism: Utopian and Scientific". In Feuerbach, L.; Marx, K.; Engles, F. (eds.). German Socialist Philosophy. Continuum International Publishing Group. ISBN 978-0-8264-0748-1. Hoak, Dale (1996). "The Anglo-Dutch revolution of 1688–89". In Dale Eugene Hoak, Mordechai Feingold (ed.). The World of William and Mary: Anglo-Dutch Perspectives on the Revolution of 1688–89. Stanford University Press. ISBN 978-0-8047-2406-7. Israel, Jonathan I. (1991). "The Dutch role in the Glorious Revolution". In Israel, J.I. (ed.). The Anglo-Dutch Moment. Essays on the Glorious Revolution and its world impact. Cambridge University Press. ISBN 978-0-521-39075-0. Israel, Jonathan I.; Parker, Geoffrey (1991). "Of Providence and Protestant Winds: the Spanish Armada of 1588 and the Dutch armada of 1688". In Israel, J.I. (ed.). The Anglo-Dutch Moment. Essays on the Glorious Revolution and its world impact. Cambridge University Press. ISBN 978-0-521-39075-0. Israel, Jonathan I (2003). The Anglo-Dutch Moment: Essays on the Glorious Revolution and its World Impact. Cambridge University Press. ISBN 978-0-521-54406-1. Marquess of Cambridge (1966). "The March of William of Orange from Torbay to London – 1688". Journal of Society for Army Historical Research. XLIV: 152–53. Mitchell, Leslie (2009) . "Introduction". In Burke, Edmund (ed.). Reflections on the Revolution in France. Oxford University Press. ISBN 978-0-19-953902-4. Schuchard, Keith (2002). Restoring the Temple of Vision: Cabalistic Freemasonry and Stuart. Brill. ISBN 978-90-04-12489-9. Schwoerer, L.G. (2004). The Revolution of 1688–89: Changing Perspectives. Cambridge University Press. ISBN 978-0-521-52614-2. Stanhope, Philip Henry, 5th Earl of (2011). Notes of Conversations with the Duke of Wellington 1831–1851. Pickle Partners Publishing. footnote 90. ISBN 978-1-908692-35-1. Windeyer, W. J. Victor (1938). "Essays". In Windeyer, William John Victor (ed.). Lectures on Legal History. Law Book Co. of Australasia. Cruickshanks, Eveline (2000). The Glorious Revolution (British History in Perspective). Palgrave Macmillan. ISBN 978-0-312-23009-8. Hamowy, Ronald (2008). "Glorious Revolution". The Encyclopedia of Libertarianism. Thousand Oaks, California: SAGE; Cato Institute. pp. 208–11. doi: 10.4135/9781412965811.n125. ISBN 978-1-4129-6580-4. LCCN 2008009151. OCLC 750831024. Miller, John (1997). The Glorious Revolution (2 ed.). ISBN 978-0-582-29222-2. Onnekink, David (2007). The Anglo-Dutch Favourite: The Career of Hans Willem Bentinck, 1st Earl of Portland (1649–1709). Ashgate Publishing. ISBN 978-0-7546-5545-9. Pincus, Steven C. A. (2005). England's Glorious Revolution 1688–89: A Brief History with Documents. Bedford/St. Martin's. ISBN 978-0-312-16714-1. Vallance, Edward (2006). The Glorious Revolution: 1688 – Britain's Fight for Liberty. Brown Little. ISBN 978-1-933648-24-8. Hallas, Duncan, O'Callaghan, Einde (ed. ), "The Decisive Settlement", Marxists Internet Archive transcribed from "The Decisive Settlement". Socialist Worker Review (113): 17–20. October 1988.